AVO Turboworld's Subaru Performance Programs draws on experience gained from 20 years of turbocharged Subaru performance tuning, and 35 years of experience in designing, manufacturing, installing and modifying turbochargers. AVO Turboworld is an industry leader in the field of turbocharger system design and manufacture and is unique in that it is a totally family run and operated business. Likewise, its engineering philosophy is also unique, in that AVO Turboworld's main design aim is to always maximise efficiency over excessive boost pressure. No ifs, ands, or buts. Our design philosophy has four important parts: optimising the intake system, optimizing the exhaust system, specifying the best possible performing intercooler, and finally, most importantly joining the whole package together with state of the art engine management that is never mismatched for the application. Many hundreds of hours are spent designing, testing and developing our range of Subaru performance parts, with a large amount of work going into ensuring that all turbosystem parts seamlessly integrate with the stock engine, transmission and electronics package. Design and development is an on-going task and is taken very seriously at AVO Turboworld, as we constantly improve and refine our range of parts and accessories. One of AVO Turboworld's main design aims is to achieve excellent power gains by maximising efficiency rather than having to depend on brute force by running your turbocharger and engine to the edge of its safety margin. AVO Turboworlds range of performance packages always take into consideration such things as available fuel octane, ambient temperature and long term reliability while having you smiling from ear to ear. AVO Turboworld Stage 1 Turbo Kit - Scion FRS / Subaru BRZ: AVO's front-mounted Stage 1 turbocharger kit for the Subaru BRZ and Scion FR-S is finally here! The turbocharger kit is designed from top to bottom specifically to the FR-S and BRZ, and consists of the all the parts necessary to bolt the kit up to the car. We utilize an AVO18/49 turbocharger that mounts up under the front of the engine via our stainless steel unequal exhaust manifold, and then it bolts up to the stock exhaust with our polished stainless steel turbo outlet (also referred to as a downpipe). Cooling the pressurized air is an aluminum bar and plate front mount intercooler which uses black piping throughout, mechanical oil scavenging pump, oil reservoir tank, and all necessary water and oil hoses and fittings. So what can you expect from this kit? From our testing, you will see anywhere from 220 to 250whp on pump gas, dependent entirely upon the quality of the pump gas. We saw 230whp (276 crank hp) and 197 ft/lbs of torque at 5-6 psi on 92 octane gas literally from a nearby Chevron gas station. This was with the stock airbox with an AVO high-flow panel filter installed, and a stock secondary cat in place. All these figures were reached on the stock fueling system as well! The item "AVO BOLT ON TURBO KIT With FMIC & CERAMIC COATING FOR 13+ SUBARU BRZ SCION FR-S" is in sale since Thursday, October 10, 2013. 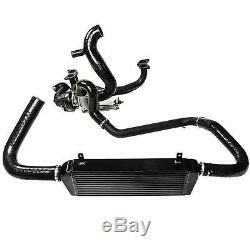 This item is in the category "eBay Motors\Parts & Accessories\Performance & Racing Parts\Auto Performance Parts\Induction\Turbo Chargers". The seller is "pfabparts" and is located in Denver, Colorado. This item can be shipped worldwide.